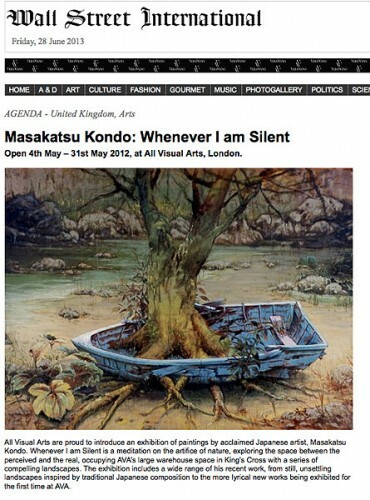 Open 4th May – 31st May 2012, at All Visual Arts, London. Masakatsu Kondo was born in Nagoya, Japan in 1962. Since graduating from the Slade School of Fine Art in 1993 he has continued to live and work in London. He has exhibited internationally, both solo and as part of group shows, competing in the John Moores Exhibition at the Walker Art Gallery, Liverpool (1997 and 1999) and the Granada Foundation Prize at the Whiteworth Art Gallery, Manchester (1993). Selected solo exhibitions include; Botany (2003) and Bridge (2007) at David Risley Gallery, London, Masakatsu Kondo at Mid Pennine Gallery, Burley (2002). All Visual Arts is a hybrid arts enterprise founded by art expert Joe La Placa and Mike Platt in 2008. AVA’s goal is to build a major collection of contemporary art by representing and commissioning new work by today’s most exciting international developing artists.